If your eye has been caught by a large swath of brilliant blue in an early spring lawn, chances are excellent you're seeing naturalized Siberian squill. Siberian squill, grown from a small bulb, is probably the most familiar of the scillas. The plants themselves don't get much taller than about 4 to 8 inches (10 to 20 cm), but they make up for their diminutive size by spreading out and blooming profusely. 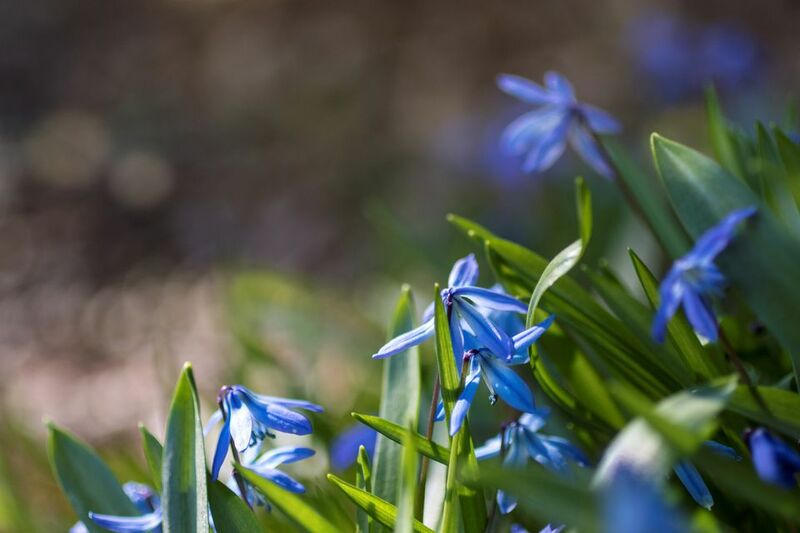 The tiny bulbs grow and multiply easily and the plants will also self-seed, making scilla easy to grow and a perfect choice for naturalizing. Thin, sword-like leaves grow from the base of the plant and arch outward, allowing the flowers to be seen unobstructed. The flowers of Siberian squill are star or bell-shaped, and they nod and droop on short stems. There are three to five stems per plant, providing plenty of blooms. Bloom time depends on the weather, but it is generally in early spring, March to April. Siberian squill is very cold hardy and can bloom through frost and even some snow. Scilla is a large genus with about 90 species, a part of the Hyacinthaceae family that includes some cold-hardy varieties as well as tropical plants. Scilla siberica, or Siberian squill, is a native of Russia and Eurasia, not Siberia. The plant probably got its common name because it is so cold hardy, blooming as far north as USDA hardiness zone 2. Plant Siberian squill bulbs where they are free to roam. They can easily light up a lawn but look much more natural under a tree, at the edge of a woodland, or scattered throughout a rock garden. Plant the bulbs about 3 to 5 inches deep. You can space them close together, planting about 15 bulbs per square foot or one bulb every 3 inches. Scilla bulbs are often sold in bulk with packages of 100 or more not uncommon. It's generally easier to dig a wide hole and plant several bulbs at the same time rather than poking many individual holes. Your Siberian squill plants aren't going to be around past the cool, early months of spring, so little maintenance is required. Don't mow the foliage down until about six weeks after the flowers bloom; the plants need time to create and store energy, before going dormant. If you would like to transplant your squill, you can either move a clump of bulbs or save the seed. Fall is ideal for transplanting bulbs, but it's easier to find them while they are still in bloom. If you move them then, be sure to keep them well watered until they get established. You can also transplant any bulbs you forced in containers. After they have completed blooming, plant the bulbs in the garden 3 to 5 inches deep and keep them watered until the foliage disappears. To save seeds, allow the pods to dry on the plants and then collect them and scatter them where you want—they will grow themselves. Scilla siberica: When unspecified, these are the standard type, featuring the familiar blue, star-shaped flowers. Scilla siberica 'Spring Beauty': This is one of the larger scilla varieties, with bell-shaped blue and up to five flower stalks per plant. Scilla siberica alba: This variety is rarer, with clear white flowers. Pests don't seem to bother with Siberian squill. If you are having trouble growing them or getting them to naturalize, it is probably a moisture problem. They prefer consistent moisture when first planted and while they are growing, but they don't really like sitting in the wet or damp soil, especially during the summer months when they go dormant. In wet soils, root rot can be a problem.